The China measures call on the Pentagon to improve arms sales to Taiwan and hold joint military exercises with the island's forces, along with increasing high-level U.S.-Taiwan military exchanges. The legislation authorizes $717 billion for defense and was completed recently after a House-Senate conference reconciled two versions of the bill. The legislation, called the John S. McCain National Defense Authorization Act after the Senate Armed Services Committee chairman who is battling cancer, also calls for blocking the Pentagon from inviting China's People's Liberation Army (PLA) from taking part in the biennial naval exercises known as Rim of the Pacific, or Rimpac. Trump is expected to sign the bill into law on Monday, a White House official said. National Security Council spokesman Garrett Marquis had no immediate comment. Defense Secretary Jim Mattis earlier this year disinvited the PLA navy from the world's largest naval exercises in the Pacific citing China's illegal militarization of disputed islands in the South China Sea. China's navy had taken part in several Rimpac exercises and during one dispatched a spy ship to gather intelligence on the war games. Sen. Jim Inhofe (R., Okla.), a senior member of the Armed Services Committee, said he saw firsthand during a recent visit to Asia China’s growing aggression in the region. "China has been heavily investing in military advancements and using their economic influence as a coercive and bullying power against countries throughout Asia and around the world—that is unacceptable," Inhofe said. The senator said he worked to make sure the defense bill was focused on confronting China’s hostile actions by blocking the PLA from joining Rimpac, and increasing public reports on China’s illegal actions, including espionage and by providing greater support and training for U.S. allies in the region. Trump will be required under the legislation to send Congress a report outlining the U.S. government's overall strategy for dealing with China, a country the administration recently identified as a strategic competitor. "Congress declares that long-term strategic competition with China is a principal priority for the United States that requires the integration of multiple elements of national power, including diplomatic, economic, intelligence, law enforcement, and military elements, to protect and strengthen national security," the legislation states. The legislation also requires the Pentagon to reveal more information about coercive Chinese activities in the South China Sea and elsewhere. For example, any significant island construction or military activities by China in the sea must now be reported to Congress and released publicly in a bid to provide greater awareness of the Chinese activities. One shortcoming in the bill was the dropping of a provision that would have banned U.S. tech exports to Chinese telecommunications giant ZTE, that has been linked to the Chinese military. The Trump administration lifted sanctions on ZTE that were imposed for illegal sales to Iran after appeals from China's President Xi Jinping. The company relies on U.S. components for its products. Dropping the legislative restrictions on ZTE in the final bill prompted Sen. Marco Rubio (R., Fla.), a staunch defense conservative, to vote against approving the measure. Rubio said he did not understand why members of Congress gave in so easily and quickly in dropping language that would have put ZTE and another Chinese telecom, Huawei Technologies, out of business by denying them access to American semiconductors. "It's time we open our eyes," Rubio said. "No country in the world spies on us and steals intellectual property from us more than China does, and they use their telecommunications companies, like ZTE, to do it. I will do everything I can to keep ZTE products out of the United States." The senator has succeeded in adding language to several appropriations bills that will prohibit the federal government from buying any ZTE products. Congress's growing concerns about Chinese investment in the United States are reflected in the bill. A new provision will require a report to the Treasury Department-led Committee on Foreign Investment in the United States every two years detailing Chinese purchases in the United States. The report must include the range of investments including companies established or acquired and valued between less than $50 million up to purchases valued at up to $1 trillion. The report must also identify Chinese companies in the United States and affiliates under control of Beijing along with numbers of employees. Regarding Chinese cyber attacks, the defense bill will give the military new powers to conduct counter cyber attacks. Language in the bill states that if military commanders detect "active, systematic, and ongoing" cyber attacks from China, Russia, North Korea, or Iran, then counter attacks against those states can be carried out. The military will be given the power to "take appropriate and proportional action in foreign cyberspace to disrupt, defeat, and deter such attacks." Currently, Cyber Command is under legal and bureaucratic restrictions that limit its responses that often require approval by the president before action is taken. Another provision requires the Pentagon to assess the electronic warfare capabilities of China and Russia. Under the new legislation, the Pentagon also will be tasked with creating a five-year plan to stabilize the Indo-Pacific region. The plan will include efforts to "reduce the risk of execution of the contingency plans of the Department of Defense by improving the operational resilience" of U.S. forces in the region, according to the bill. The Pentagon also must outline the forces required for the stability initiative and support and logistics needed. The Pentagon's annual report to Congress on the Chinese military also will be augmented by the new legislation. A new provision calls on the Pentagon to included details of China's overseas military bases and logistics infrastructure. China currently operates a military base in Djibouti near the Horn of Africa and the strategic Red Sea chokepoint known as the Bab-el Mandeb. U.S. officials expect other Chinese military bases overseas to be established in the coming years as part of China's global expansionism. 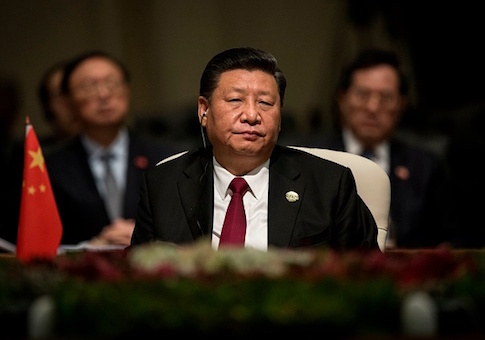 The annual report also will be required to include details on Chinese influence operations through the media, cultural institutions, businesses, and academia. On Rimpac, the legislation will require that China will not be allowed to participate in the naval exercises unless the defense secretary certifies that China has halted all island-building in the South China Sea and removed all weapons from militarized islands there. China's military also must demonstrate a four-year record of taking steps to stabilize the region before being allowed in Rimpac. The Taiwan provisions drew criticism from China's government. Foreign Ministry spokesman Geng Shuang told reporters in Beijing Aug. 2 the defense bill reflects the United States "Cold War and zero-sum mentality." Geng also said the U.S. government should not allow "negative China-related content to pass into law." "We firmly oppose any official exchange and military contact between Taiwan and any country," Geng said.